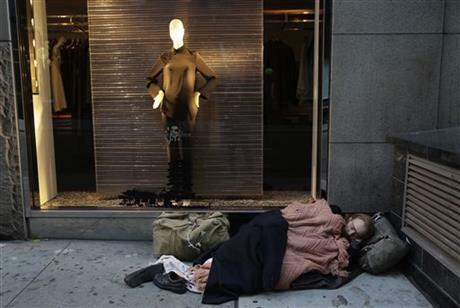 In this Wednesday, Nov. 20, 2013, file photo, a destitute man sleeps on the sidewalk under a holiday window at Blanc de Chine, in New York The growing gap between the richest Americans and everyone else isn’t bad just for individuals it’s hurting the U.S. economy says a majority of more than three dozen economists surveyed in December 2013 by The Associated Press. (AP Photo/Mark Lennihan, File)A majority of "private, corporate and academic economists" agree: economic inequality in the U.S. is not just hurting individuals and families who struggle to make ends meet; the growing gap in both wages and wealth is harming the economy as a whole. That's according to a new survey by the Associated Press which confirms what progressive-minded economists and policy-makers have been saying since... always. Spending by wealthier Americans, given the weight of their dollars, does help drive the economy. But analysts say the economy would be better able to sustain its growth if the riches were more evenly dispersed.